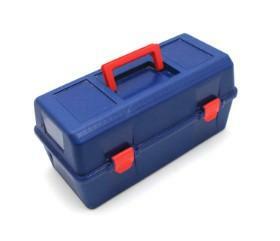 A caddy is a toolbox for decorators. A cake decorating caddy is one supply decorators often end up purchasing once they have amassed a large number of other supplies. Caddies are useful not only for transporting supplies, but also for storage and organization. Cake decorating involves a number of small supplies, like tips and couplers. It also involves specialty supplies, like piping gels, stencils or dusting powders. Having these supplies tossed into a drawer makes it difficult to find them when needed and the smaller items might even get lost in an unorganized kitchen. A decorating supply caddy is the perfect place to hold all of your tools. Beginner decorators will enjoy having one place to store all of their new supplies, while more experienced bakers will enjoy the ease at which s/he can find a particular item. Amateur and professionals who bake and decorate cakes for others frequently use caddies to transport supplies for making last minute touch-ups to decorated cakes made for birthday parties, weddings and other functions. Storage: If your kitchen is small, you can use your caddy as regular storage for a small to medium sized collection of decorating supplies. Transportation: A caddy makes it easy for you to grab your supplies and go when it comes time to deliver a cake. Decorators always take a few supplies in case of a cake emergency. Organization: Instead of digging through your kitchen or a bag, you can keep your tips organized numerically and your fondant and buttercream decorating supplies separate. While you can store and transport your decorating items in regular bags or boxes, a caddy is useful because it is made especially for cake decorators. Just as a mechanic would not store tools in a cardboard box, neither should decorators store the tools of their trade in a container not meant for that purpose. The size and style of cake decorating caddy you purchase depends on how often you plan to use it and the reasons for purchasing. A small caddy might do if you have few supplies and rarely use them; a large caddy might be in order if you have many supplies and no place to keep them. Find decorating caddies at the same places you would purchase cake decorating supplies: craft stores, kitchen retailers and online. Companies that provide other supplies also make caddies. Experienced or professional bakers can purchase multiple caddies, each for a different use. A cake decorating tip caddy will keep tips and couplers organized, while leaving the larger caddies available for stencils, frosting spreaders and other large tools. While you probably will want to skip using a single bag or box as a caddy, you do have options other than what is as a labeled cake decorating caddy. The key to a caddy is how it is organized. Look for scrapbooking bags with lots of pockets or even a makeup train case with compartments perfect for stashing tips and more. A lightweight, plastic toolbox can double as a caddy, too. Decorators who are just starting out might notice that some caddies come filled with supplies, while others are empty. The style you choose depends on your budget, current supplies and anticipation of use. Purchasing a stocked caddy is more cost prohibitive than one that is empty. If you all ready have a lot of supplies, it will pay to check the contents for duplicates. You may want to hold off on purchasing a stocked caddy if you have not taken a class or experimented much with cake decorating. If you aren't sure about cake decorating, save your money and wait to purchase any caddy, especially a fully stocked one, until you know whether decorating is for you. Cake decorating requires a number of tools, and a caddy is one efficient way to keep things organized. Choose one based on how you plan to use it and the number of cake decorating supplies you plan to keep in it.